With the January transfer window now open for business, Empire of the Kop rounds up the latest LFC transfer news. An exclusive report by Squawka claims that Liverpool manager Jurgen Klopp has added Mexican striker Raul Jimenez to his list of potential summer transfer targets. The 25-year-old Benfica frontman is valued at £22m, say Squawka, who add that Liverpool understand he is unavailable in January, but could be prepared to wait until the end of the season. Jimenez – who has been capped 49 times at senior international level – has scored eight goals in 18 games for Benfica so far this term. 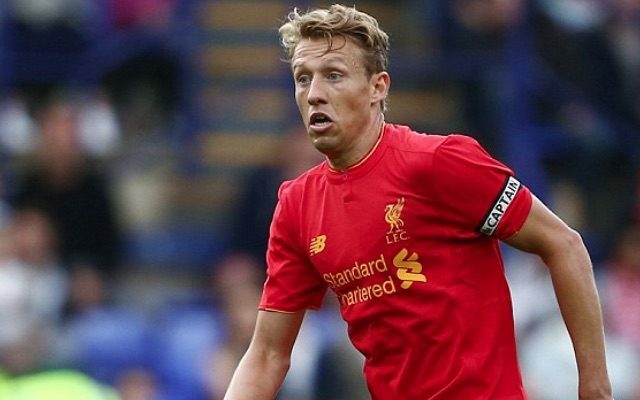 In Italy, calciomercato.com report that Liverpool have given the green light for Lucas Leiva to join Inter Milan in January, but not on a basic loan deal. CM suggest that a “dry-loan” was Inter’s preference, but that the Reds want assurances the Serie A club will sign him on a permenant deal at the end of the season. Considering Lucas will be out of contact in June, it seems strange the Reds would make such demands. Either calciomercato.com have got it wrong, or Liverpool want to guarantee that Lucas – an Anfield servant of nearly 10 years – goes to a good home when he leaves Merseyside. Reports that Klopp is monitoring Joe Hart have been dismissed by Sky Sports, who claim that the Manchester City goalkeeper is not a target for Liverpool in this transfer window or the next. Rules would not allow Hart to play for Liverpool this season even if he were to sign in January, as players can only represent two teams in one campaign – he has already played for City and Torino, where he is on loan. Regardless of those rules, Hart is simply not in Klopp’s thinking, it seems, with the German presumably keen to persevere with Simon Mignolet and/or 23-year-old Loris Karius. Reds midfielder Georginio Wijnaldum has had his say on reports – in the Liverpool Echo – that Spartak Moscow winger Quincy Promes is one Klopp’s radar. Dutchman Wijnaldum is an international teammate of Promes and admits he would love to be clubmates too. Wijnaldum is quoted by ESPN as saying: “I think he knows how great Liverpool is – I knew it before I came here. “I don’t know if everything is true about what they say as I don’t speak with him about that. “Of course I want him to come to Liverpool because I know he is a good player and also a good person who can help the team but it is something for the manager and the scouts, not for me. Promes has an excellent scoring record for Spartak, netting 37 goals in 72 appearances.